One of Canada's early Radio Amateurs from Winnipeg built one of the first pieces collected by the Museum Founder, Fred Hammond. This "Home Brew" radio (a slang for radios built at home) was built in the early 1920's probably from a circuit drawing printed in Popular Science or some similar periodical. 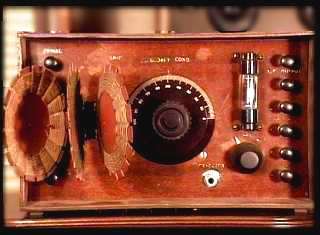 The single "Myers" tube design used as a detector featured the traditional 3 stages of adjustable coupling to fine tune the antenna input as well as the coupling into the grid of the tube and then the third coil to provide just enough feedback to place the tube into oscillation. This unique tube was first manufactured by Myers in Philadelphia until the company ran into patent problems and moved manufacturing to Montreal Canada. When patent problems continued, like so many other inventive manufacturers, the company was forced out of business. This five tube Home Brew model was also made by a radio enthusiast from a circuit in Popular Science in the early 1920's. A new feature to assist in proper adjustment were the volt meter and plate current meter shown in the top right corner of the radio. 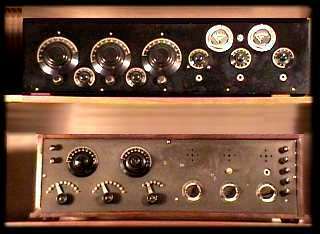 As with most home brew circuits of the era, the reliable 201A tubes were used. Modern Electric's publisher Hugo Gernsback, was probably responsible for most of the innovative home brewing during this era. Radio building enthusiasts such as Dr. Middleborough, from Owen Sound Ontario Canada would wait for each of Gernsback's issue of Modern Electric's and Hugo's radio news. Taking circuit designs from readers, hobbyists would duplicating and improve on the designs. These drawings and photos would then be sent to Hugo for publication in future issues. This led to continuous improvements in received design allowing home hobbyists to stay on the leading edge of receiver technology. The Gernsback name lives on today as the publishers of Popular Electronics and Electronics Now. 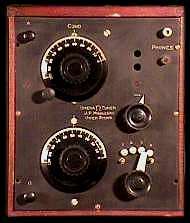 In the early 1920's, Dr. Middleborough built several Models of receivers he named the OMEGA series. Sales were quite brisk in the Owen Sound area so he built the Towns first transmitter using 202 transmitting tubes and 216 rectifiers. Since his station did not have a licence, it could be classified as Owen Sounds first pirate broadcasting station preceding CFOS by many years. 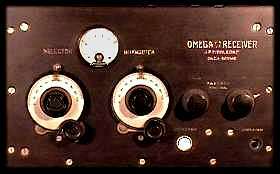 Fred Hammond acquired these Omega model receivers in early 1980's just prior to the Doctor passing away. 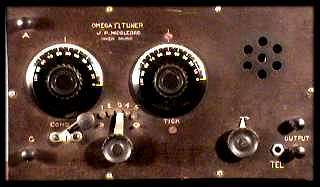 You may view these rare Omega receivers at The Hammond Museum of Radio.